Seen from above, Villa Malaparte is truly breathtaking. You come across it suddenly, along the Pizzolungo trail between the Tragara scenic overlook and the Arco Naturale natural stone archway: an imposing brick red structure jutting out from the rugged cliffs of Punta Massullo, surrounded by the lush Mediterranean countryside and overlooking the shimmering blue sea. The villa is an example of rationalist Italian architecture and, though attributed to architect Adalberto Libera, is the work of Curzio Malaparte, writer, intellectual, journalist, and poet, who for years lived in this magnificent residence perched on the rocky coast of Capri. "The day I began building my home, I didn't think I would be creating a self-portrait", Curzio Malaparte said when writing about his beloved villa, which he liked to define "a house like me". As introspective and multi-faceted as the author himself, Villa Malaparte is full of hidden meanings, symbolism, and metaphors which reveal the inner workings of Curzio Malaparte's mind and character, and also his life story, which was deeply influenced by the war. Indeed, the villa could be seen as the symbol of the prison from which, Malaparte wrote, "intelligent, cultured, and civil men attempt to free themselves through learning, culture, and poetry". Or the minimalist architectural style can be seen to recall the forms of the hammer and sickle, symbolizing his familiarity with Russian culture at the time. The almost monastic simplicity of the facades, internal spaces, and decor reflect, instead, the writer's profound religious faith. The draw of Villa Malaparte is primarily its blend of nature and archecture, an unusual and perfect balance. The beauty of this unique place wasn't lost on director Jean-Luc Godard, who filmed Contempt, with Michel Piccoli and Frinz Lang and based on the novel by Moravia, inside the villa with the still very young Brigitte Bardot, whose scenes wandering the rooms and the terrace only added to the legend of her beauty. 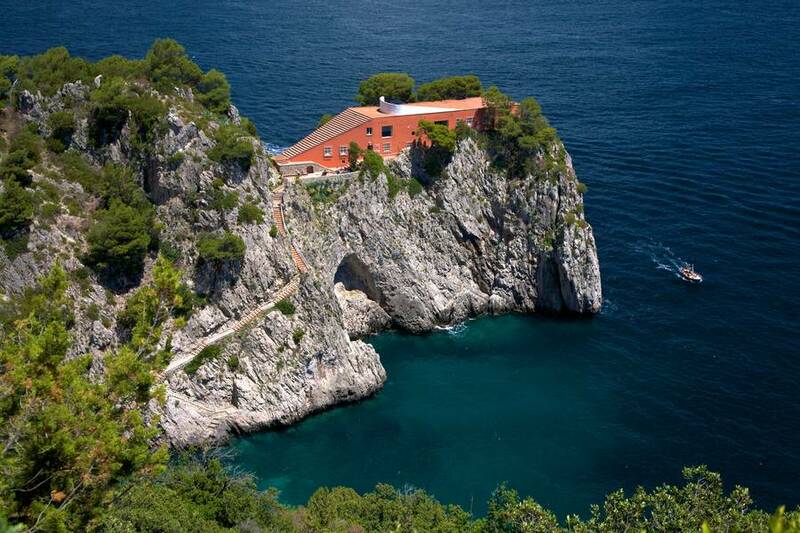 Today Villa Malaparte is home to the writer's descendents, and is a private villa closed to the public. That said, it is one of the most beautiful sights on Capri and can be admired along one of the island's most scenic walking paths.